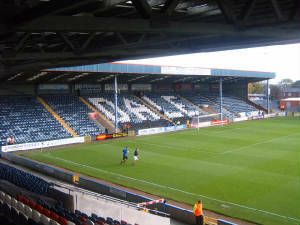 Rochdale, the most unsuccessful league club in history has a rather nice ground with an odd name of Spotland, makes it sound like a large collection of spotty people but oh well. Getting to Rochdale is a decent enough trip, no real problems getting there although once inside Rochdale, it is a bit of a farce. 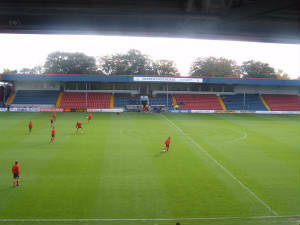 However, after you've gone through the maze that is Rochdale, you finally arrive at Spotland. The outside of the ground is populated with a mixed variety of things including a pub right on the corner of the ground which amazingly for me, I've been in. It was alright, bit too blue for my tastes but oh well. Once you're inside the away end you are greeted with a very nice ground and arguably, the best in the division for overall quality. The away end is also suprising because not only is it all seated, not only is it at the side of the pitch but you get it all to yourself which is incredibly suprising because you'd think away fans would have been given the terrace behind the goal to the right. This stand is an extremely good stand with an excellent view of the action and great leg space although the stewarding is something that can definatly be debateable. 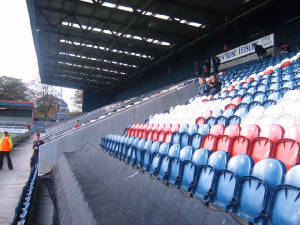 The stand to the left of away fans is an excellent end and is a large seated area with "DALE" written across it and this seems to be the most popular stand with the home fans. 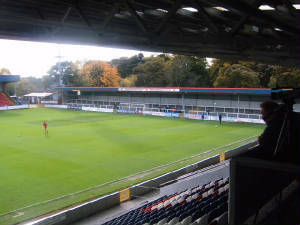 The stand opposite away fans is another pitch length seating area with the executive boxes above them, however, the quality of this stand isn't as good as that one containing away fans. The final stand is an average sized terrace. 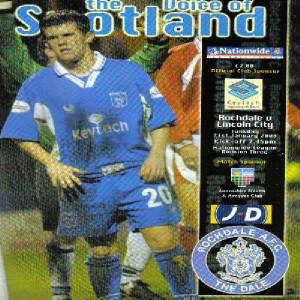 Atmosphere wise, you could do better in the division with only a small amount of fans in the "DALE" stand making any noise at all and even that isn't great and only comes when they're winning. The one thing I seriously dislike about Rochdale is that their fans seem to have a huge chip on their shoulder. They seem to think that everyone looks down to them and 99% of them just seem not to want to talk the away fans. Some of their fans also have a highly charged desire to hurt away fans, this is most often seen at the end of games when the local idiots trying to attack away fans as they come out of the away end. Other than that though, I would recommend a trip to Rochdale to anyone because it is a thoroughly enjoyable trip to make and there are very few negative comments I can make about it. It is one of my favourite annual trips and not just because more often than not, we win there but because it's a great all around experience.